Exactly why do I keep a little tin of useful survival items with me at all times? The same reason why I keep a mini flashlight hanging around my neck, a gerber knife on my pocket, and a paracord anklet (CLICK HERE for instructions to make your own) around my sock. Just in case I need them. I like to be prepared. Not a day has gone by that I haven't used my flashlight and knife since attaching them to myself. They have proven to be incredibly useful tools on a daily basis, especially while I'm housekeeping (believe it or not). 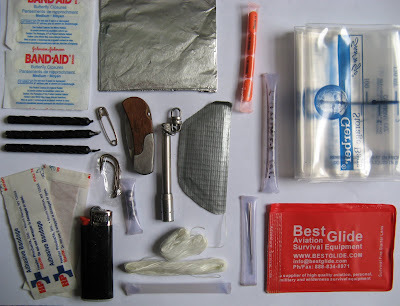 Can such a tiny survival kit of so few items really come in handy at all? How could I survive with the stuff in a little tin? I've already needed my little survival tin several times while I was out and about, whether it be for a bandaid, a lighter, an Ibuprofen, or some neosporin. I'm positive that I will continue to use it many more times throughout the future. You can fit a surprising amount of useful stuff into such a small container, such as fishing gear (provides food), water purification tablets or bleach (provides clean water), wilderness tools (for navigation, fire-starting, etc), and medical supplies. You should know by now that I'm a big "research" person. I like to be extremely thorough and learn as much as I can about whatever topic interests me at that moment; therefore, when I first started getting into survival information and preparedness, I did a lot of online research, reading about bugout bags, bugout vehicles, and survival tins. When it comes to these mini "pocket" survival tins, I learned that MOST people make their kit inside an Altoid's tin (or sardine tin). 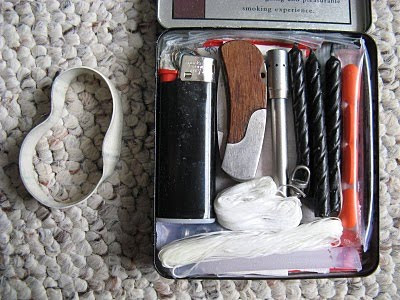 Many sites actually sell a pre-made survival kit in an Altoid's tin, although I would think that most people would rather just make their own kit (cheaper and more personalized). 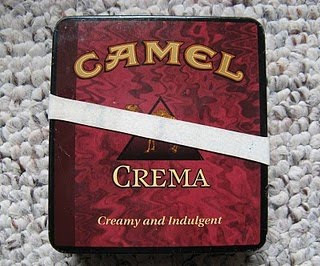 While I was helping to clear out an Estate last fall, I found an old metal Camel cigarette box that I figured was perfect for my personal survival-kit. It isn't very thick (so it won't hold much), but it will hold enough, and it will slide easily down right into a back pocket or purse. By having this little kit and knowing how to use everything in it, I just feel more prepared, no matter where I am. Only use "regular" full-strength Clorox bleach containing 5.25 percent sodium hypochlorite (read the label). To purify one gallon of water, use 8 drops (OR 1/8 tsp) for CLEAR water, and 16 drops (OR 1/4 tsp) for CLOUDY water. My little Gerber storage bags each hold 1 cup of water, and there are 16 cups in one gallon; therefore, I only need to use 1 drop of Clorox bleach per 1 cup of water. Nice post. I really like the straw idea...I'm gonna use it. I carry something similar but not nearly as well thought out. I agree with Guntard about the straws. Great idea! S, you write the coolest blog posts! Right down my alley. And you're the first woman I've "met" who is interested in and pursuing this type of knowledge. Did you ever read the book Emergency by Neil Strauss? It's entertaining and sort of a lightweight manual on creative ways to prepare ahead of time for survival needs when everything falls apart. Take a look next time you're near a bookstore if you haven't read it! BTW, I'm also a fan of 550 paracord and it makes great cord for learning to tie knots. Just curious about your anklet. Is it braided to give you more length if/when you need it? If not, what can you do with 6" of paracord besides fish out the inner strands and use them as sutures or floss? Thanks for writing up this post, you inspired me to make a pocket survival tin too, even ought I live in the city. One thing I done this year was minimalism, I threw/donate everything until all my stuff can fit in a backpack and I reduced my outfit to 2 sets. Excellent post! I have been planning on doing this forever and haven't gotten to it. I think your post was the inspiration I needed to finally get it done! Thanks and well done! Excellent post! Thanks for all the resource links as well. I'm mentally bookmarking the project for a future rainy day. Hey, I just wondered what you want the birthday cake candles for? Matt - the bday candles are for easily starting a fire when it is wet out or raining. Hi Falia, I have been cruising through your vids and articles and I must say: they're great. Thanks for posting them. Now I will address one probable issue with your Purse Survival Tin. You used duct tape to secure the two razor blades. Over time the glue on duct tape will transfer from the tape backing to whatever else it is in contact with. That is why hvac contractors don't use it on ducts. They use a foil tape with a long life adhesive. That would work well for your purpose and I think long life painter tape would also do well - but not the cheap paper masking tape. It really depends on the zombies. If they’re Romero/Brooks, slow, lumbering zombies, a baseball bat will work just fine. Not so if they’re the Zack Snyder fast zombies. Running zombies change everything. You have it set up great and your "Tin" was well thought out. I'm glad I found your video on YouTube while looking for a concealed carry holster for my wife...perfect and I do believe that we watched all of your videos. I keep a survival "Tin" similar to yours in my truck and bits and pieces of it have been used often over the years and get replaced after they're used up. I had not thought about using the straws the way you did; that was brilliant and I now have them in my "Tin". The P-38 I have those little things all over the place. On key chains, in tackle boxes, in my "Tins" in the boat etc. If you and yours ever want to travel to Texas to spend some time in the woods, hunt and shoot let me know. We'd love to have you stay with us. I'll be checking in to see what's new. This is a really great post. I made three of these pocket survival tins for myself and other family members. In all three of those, the straw with the bleach in it leaked. Not at the seal points, but in the middle of the straws. The bleach ate away at the plastic. The bleach was the correct strength and the seals on the straws weren't at fault. I am trying to come up with another viable option to carry bleach in a small, leak proof container. Jessica, I have since switched to putting water purification tablets in my tin instead. Here are some changes you might think about making. First, swap out the lighter and candles for a metal match and cotton balls rubbed with Vaseline. The lighter can leak and/or explode posing a great danger to a survivor. Simplicity and safety are key. A metal match always lights, under almost any circumstances, after any length of time. Cotton balls and Vaseline make an excellent tinder, acting almost like sterno. You can also add a heavy duty trash bag, like the ones used by road crews for debris clean up. Cut a hole near the bottom for a face and presto- instant survival shelter. Keeps one person warm and dry in the worst of conditions, and is much more durable than a solar blanket. As for line, have you considered parachute or 550 chord? It will suit most purposes for which you've included other lines/twine and also serve as a welcome addition to the construction of more permanent shelters. Finally, have you considered signaling devices? A whistle is great for nearby signals, since voices attenuate at very short distances. And bonus- a whistle makes a great addition to a layered personal defense strategy. For long distance signaling, nothing beats a signal mirror. You can reach out and touch a plane 20+ miles away if you know how to use one. It's been reported that survivors have even signaled passing aircraft with the reflective hologram on a credit card. I found your blog looking for holsters for women...you have the best comprehensive video's and that really helped little me out (less than 5ft less than 100lbs). I had never heard of a survival tin but I'm making one now. Thank you for the time and effort you put into your blogs and videos! Just picked up the summer edition of "off the grid" magazine. PACKED FULL OF EXCELLENT INFO! Everything from medical advice, to firearm selection, food prep and there was even a tutorial with great illustrations on how to distill water with only a few inexpensive components. Give it a read if you can find a copy. Wow you're doing survival gear now too? I always share your vids, liked your page on FB and everything. But in Survival it is a LOT different. Folks tend to rely on their gear. I rely on my knowledge and mother nature. Primitive Living Skills is the best bet for anyone. I may have a "BOB" but that would either be for a gf or family member. Me personally I like to live off the land. As long as I have a good full tang fixed bladed knife, a mag/ferro bar, and a metal pot and maybe some paracord i can survive. I love guns but in a Survival Situation (if you're not trying to be found) guns aint the best bet. I have a "Survival Bow" that is a 50lb Carbon Fiber bow. 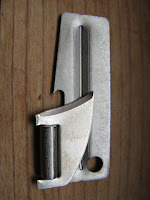 I have Carbon Fiber & Aluminum arrows but if needed i can make my own. I also have it set up i can turn it into a Fishing Bow. Most things in a Bug Out Bag are comfort. Learn the ways of the land as the Mountain Men did and you won't need modern things. great job btw with everything!!! David - I highly agree with you. I personally have a long way to go still in terms of learning & preparation, but primitive living skills are a HUGE part of what I'm most focused on. yes am'am...thats the one...as you turn the pages, it seems all pretty repetive..like things we already know...but there are a few new things I picked up from reading it...not a bad read.